PC/104 is a standard for PC-compatible modules which are intermateable to set up a complete embedded computing system. PC/104-Plus features 120 pins with a distance of 2.00 mm and the female connector is now available in both the standard height and this higher design, permitting a board to board distance of 22 mm and thus the stacking of more components: for example heat sinks, fans, power modules etc. Standard PC/104 connectors accommodate a board to board distance of 15.24 mm. This was usually enough to connect two boards. However, with the ever increasing requirement to connect more components, for example heat sinks, fans and other cooling systems, manufacturers now often need a greater distance. As a specialist for connectors ept has reacted to this need and as a result is now the first provider to have a suitable connector in its lineup. The PC/104-Plus Female connector is available both in the standard height as well as in this higher design, permitting a board to board distance of 22 mm. ept is offering PC/104-Plus connectors with both short and long pins. The long pins enable additional circuit boards to be connected directly (rear mating zone plated performance level III), which means the new connector can be combined with all existing and available PC/104-Plus boards. While the PC/104 bus comprises two connectors with 40 and 64 pins which can be placed side-by-side and a grid size of 2.54 mm, the PC/104-Plus features 120 pins with a distance of 2.00 mm. The superior option for applying a long tail stack-through connector is with compliant pin technology. 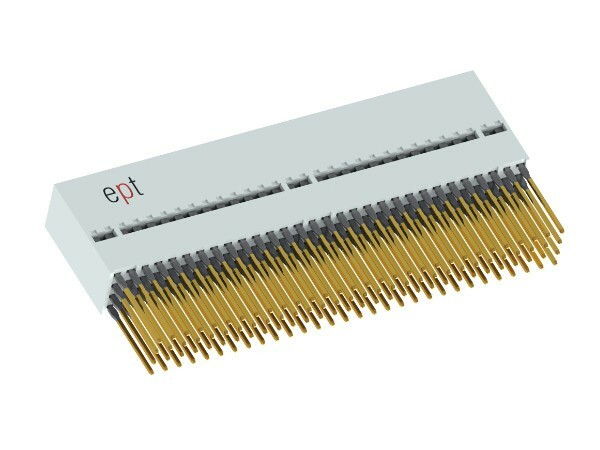 Adopted by the telecom industry many years ago, ept press fit technology has proven itself to be a cost-effective alternative to soldering connectors to a board. The compliant pins on the connector are designed to deform during the “press-in” process, resulting in an extremely tight and reliable connection to the PCB. Female connectors can be pressed in with the same ept press-fit tool in one single step ~ offering significant time-savings in production. The ept press-fit sections – solid and compliant pins – meet the requirements of the DlN 41612 Part 5 and IEC 352-5 specifications. Plated through-hole according to IEC 60352-5 Printed Circuit Card through holes must meet these specification for press-fit insertion of pins.